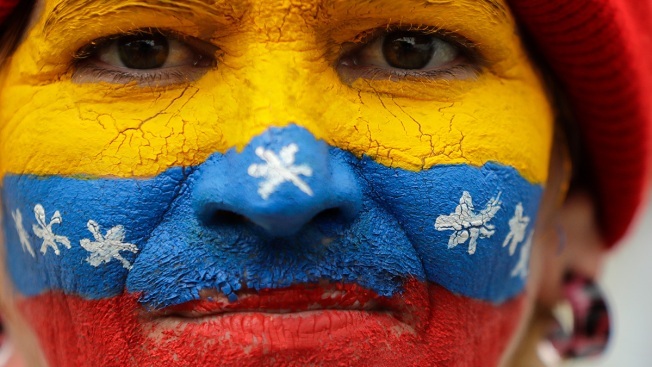 Her face painted in the colors of the national flag, a supporter of opposition leader Juan Guaido, Venezuela's self-proclaimed interim president, waits for his arrival in Los Teques, Miranda State, Venezuela, Saturday, March 30, 2019. Venezuelan President Nicolas Maduro on Sunday announced a 30-day plan to ration electricity following nationwide power cuts that have inflicted misery on millions of people and ignited protests, including one near the presidential palace in Caracas. The rationing plan will help deal with the outages that have also cut off water supply and communications for days at a time, Maduro said in a speech on national television in which he also warned against any unrest in reaction to the blackouts. Hours before Maduro's appeal for calm, protests broke out in neighborhoods in the capital and other cities following a call by opposition leader Juan Guaido to demonstrate against the government's failure to provide basic services. Many took to balconies and building windows to bang pots in protest and shout curses at Maduro. They also burned trash and blocked roads. While police did not intervene in most cases, alleged government supporters known as "colectivos" appeared in some areas on motorbikes and threatened protesters, who quickly dispersed. The "colectivos" are sometimes armed and video posted on social media showed masked men as well as men firing shots in the streets. 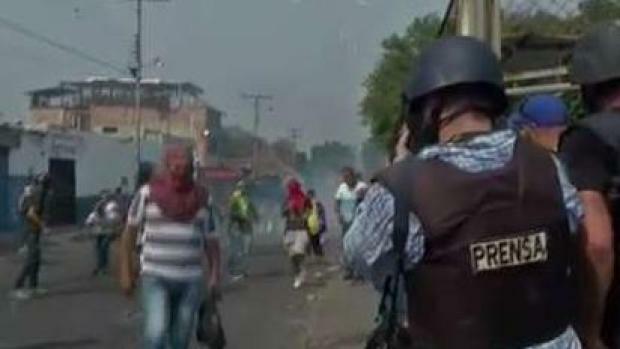 President Nicolas Maduro's forces fired tear gas and buckshot on activists trying to deliver humanitarian aid in violent clashes that left two people dead and some 300 injured. NBC 6's Erika Glover and Nathalia Ortiz report on the crisis in Venezuela. In his speech, Maduro said "colectivos" and other pro-government groups should keep order as Venezuela grapples with the blackouts, which he has blamed on U.S.-led sabotage without offering clear evidence. "We're confronting monsters who want to destroy Venezuela," said Maduro, who said the electricity rationing would balance generation and transmission with consumption, with the aim of ensuring water supply. Guaido says years of government neglect, mismanagement and corruption have left the electrical grid in shambles. "There is no sabotage," the leader of the opposition-controlled National Assembly wrote on Twitter. "They brought the electrical system to a collapse because they are corrupt and now they can't resolve it because they are incapable." Some of the protests on Sunday occurred near the Miraflores presidential palace in Caracas, in a direct challenge to Maduro. "No one can put up with this. We spend almost all day without electricity," said Karina Camacho, a 56-year-old housewife who was about to buy a chicken when electronic payment machines stopped working. "There's been no water since (last) Monday, you can't call by phone, we can't pay with cards or even eat." The ongoing blackouts now mark another point of tension in a country paralyzed by political and economic turmoil, compounding a humanitarian crisis and deepening a prolonged standoff between two political parties vying for power. Netblocks, a group monitoring internet censorship, said network data showed just 15 percent of Venezuela was online after the latest power cuts struck Sunday morning, while water supply, phone service and internet continued to be shaky and unreliable. The United States and dozens of other countries support Guaido's claim that Maduro's re-election last year was illegitimate. The U.S. has imposed oil sanctions and other economic penalties on Venezuela in an attempt to force him out of power, but he has yet to show signs of backing down. The latest outage comes just weeks after Venezuela experienced nationwide blackouts on March 7 which shut down schools, offices and factories and paralyzed nearly every part of the oil-rich country of 31 million. Associated Press writer Jorge Rueda contributed to this story.